"Flipp is the essential app for your weekly shopping. Search circular deals and coupons by item, brand, or category to quickly find the best deals on your weekly essentials and make saving money super easy. Flipp is the only app that matches local circular deals with coupons from the brands you love to bring you the most savings. Simply add loyalty cards from your favorite stores on to Flipp and then clip coupon deals to your card for instant savings at checkout. To keep you on track of your weekly shopping, Flipp’s ultimate shopping list will help you plan ahead by finding what’s on sale and stay organized in-store. 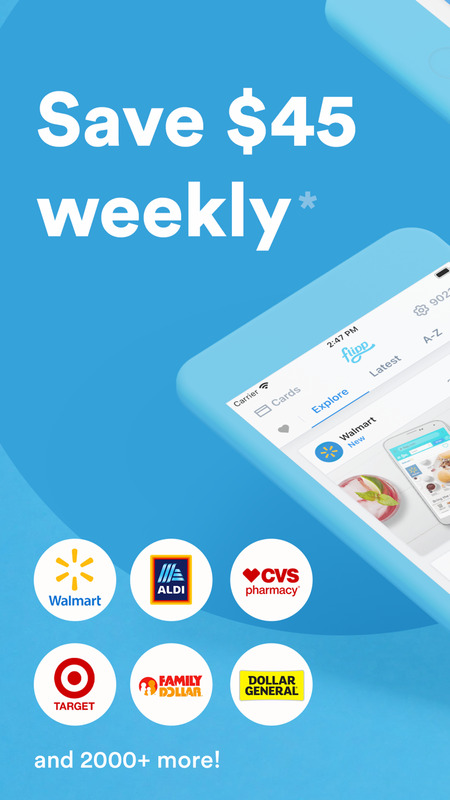 Flipp brings you the latest weekly ads from your favorite stores including Walmart, Target, Family Dollar, Walgreens, Kroger, and over 800 more retailers. You can save 20-50% on the items you need every week. Save money on your favorite brands with coupons from Tide, Gain, Dawn, Crest, Charmin, Bounty, Olay, Pampers, and hundreds more. USA Today -- ""Flipp is the ultimate flyer aggregator. Don’t shop without it."" 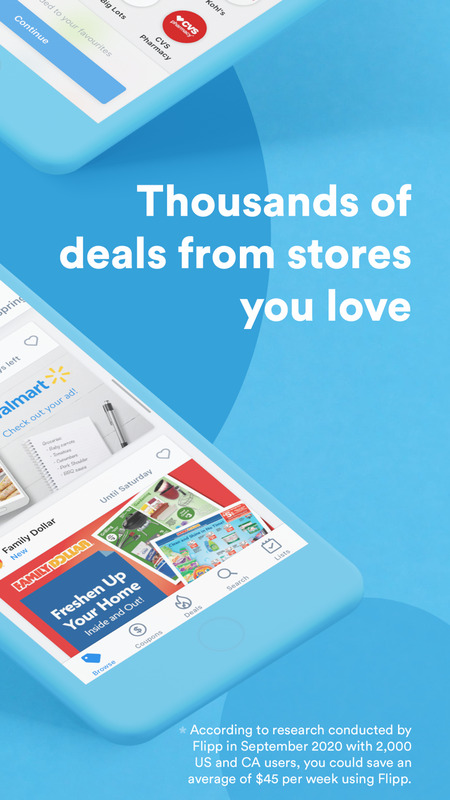 Flipp has been named a top shopping app to help save money in over 350 publications including TechCrunch, ABC News, Forbes, USA Today, The Washington Post, and the Boston Globe. Top Mom Bloggers are calling Flipp their “shopping buddy”, the “go-to app for saving money”, their “best friend” and a “life saver”. Quickly browse through your favorite local weekly ads including Fry’s Food Store, Food 4 Less, BI-LO, Winn-Dixie, Kroger, and more. Match hundreds of coupons with weekly ads from the brands you love for the most savings. Plan ahead and discover deals for each item in your Shopping List. Search through hundreds of items, retailers, and brands. Clip items to organize deals to make your shopping trip easy. Receive reminders about expiring deals, new offers, and updates from your favorite and nearby retailers to stay on top of your deals. Print coupons at home and save at Walgreens, CVS, Rite Aid, Target, Walmart, King Soopers and more. Continued use of GPS running in the background can dramatically decrease battery life." Flipp just made it easier to see item details! Search for an item and tap the deal you like to show more product details, features, and even reviews. Flipp is revamping its coupons experience to help you save more. Tap the coupons tab and choose a retailer to discover available coupons in your area.